Start the series and find out why paranormal fans are loving it. Hunter angel Eli lives by his own rules and bows to no one. But when a powerful council deems the angel has lost his humanity, he's sentenced to earth with one mission--learn compassion or be condemned to Hell. Ashley has always been different. With one glance into a person's eyes, she foresees their death--so she tries not to look. She even moves to the wilds of Alaska to get away from civilization, which works just fine until a handsome stranger rescues her from a surprise attack. When Eli spots Ashley across a bloody battlefield, he can only steal a moment alone with her. Powerless is an emotion new to the hunter, but it’s one he faces daily when he realizes killing the demon king in order to free his mate is out of the question. ‘Death’ was not a nickname Ashley wished to carry. Being the only one able to stop Lucifer’s evil plan was an even worse fate. When she discovers her true ancestry, fear that she will succumb to her darker side forces her to dig deep for the strength she needs to fight. He mated to protect her. She used him for revenge. As their worlds collide, their feelings for each other grow. But, when his dark secret is revealed, it may be more than she can forgive. Lyzander has done many distasteful things in his life. One in particular has haunted him for the past twenty years. Now, the little girl he sheltered from the ones who killed her family has become his savior. When she seeks to avenge the murder of her loved ones, he finds himself saving her all over again. Kelana has an agenda, and if mating with the angel warrior Lyzander will bring her closer to completing her mission, then she will gladly take him to her bed. When her father discovers the abomination he created is still alive, he proves more powerful than she imagined and it will take everything at her disposal to survive. 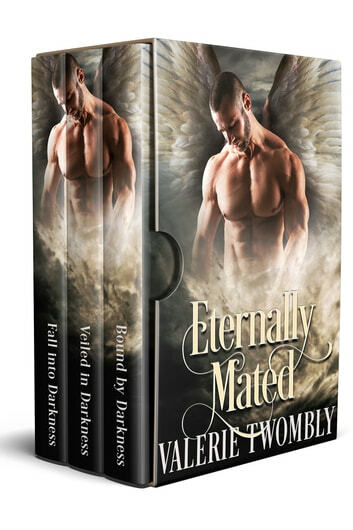 When I first started reading eternally mated I was not impressed with the first book in the beginning I felt that it was a little slow and I wasn&#039;t getting into the story very well but I continue to read and boy am I glad that I did. This book has now captured my attention and I could not wait to finish it. The characters actually come to life for you a little better as you get about halfway into the first book. Eli is this badass Rogue angel that plays by his own rules. Boy as you read more about Ashley she is a real different package than you will expect. Things about her past and her future will come forth the she will not expect and as the reader you won&#039;t expect them either. Overall this collection of stories was well worth reading. I received a free copy of this book and am voluntarily leaving a review. 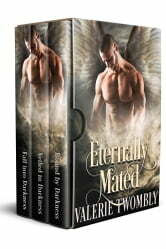 The Eternal Mates Box Set is awesome, fantastic, exceptional, etc. They are action packed and filled with love, betrayal, honor, dark humor. The character development is exceptional -- some you will love while others you just want to kick their butts to get with the program. I thoroughly enjoyed this box set and honored to recommend these three books. I received a free copy of this book via Booksprout and am voluntarily leaving a review.